Well we know that in a certain corner of the globe wedding fever is almost upon us. 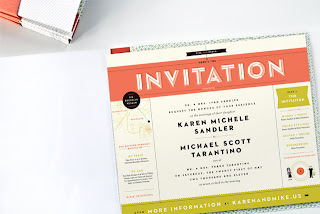 Therefore, mildly in-keeping with that theme (hardly at all really) I saw this wedding invitation the other day and I just had to post in admiration of this design project. How super cool and cute! Functional, yet so lovely to look at. 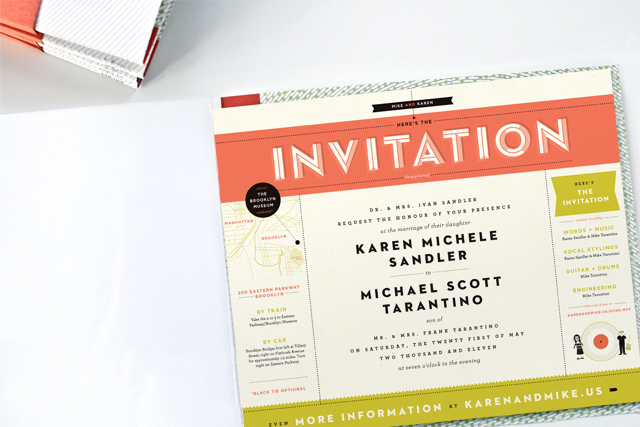 The design of this invitation is right up my street. Almost 9 years ago now (I can hardly believe it's that long already! ), the invitation to our wedding was a mix cd. The sleeve being the invitation, the music being a soundtrack for getting ready in the morning. Lots of our friends thought it was cool. Something that they would keep among their music collection, a memento that they'd always have. However, that was in the days before MP3 players. I wonder how many iPods our little invitation made it on to? I know it's on mine!